We are proud to announce our package "Atuta 2008"— our third version of "Atuta" which includes 14 Assyrian fonts, regular and mirror, cliparts, photos of the Assyrian monuments, sample files in "PrintMaster" format, music files in mp3 format, bookmarks and printed sheets showing the location of the Assyrian characters on the keyboard, a "PrintMaster©" software and a sixty (60) page full illustrated user's manual pocket size book. We have added some new characters to make the typesetter's pages more attractive. All the previous characters have their location, so that by installing these new fonts the old typeset pages will not be altered. Unlike the previous versions, "Atuta 2008" now incudes the software "PrintMaster®" to make "Atuta" package a stand-alone product. The "PrintMaster®" software by itself, has tons of sample files of creativity tools, invitation card samples, birthday cards, flyers, posters, banners, you name it, and help files which will talk to you, helping you step-by-step to create you pages… which by changing the fonts of their sample files to "Atuta" fonts, you can recreate publications in Assyrian language. price: $50.00 each. 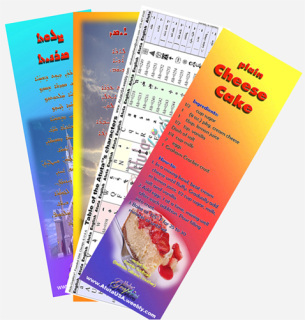 Basically, the designs are the same as the bookmarks, only larger 3½"x10", designed to be framed. Large artworks are large size 4"x16", designed to be framed and hung on the wall, individually or three and four together for well balanced decorative set.